When a potential resident, usually accompanied by their family, making a great first impression is vital if you want them to stay permanently. After all, this is going to be there new home, so making sure it looks great is essential. 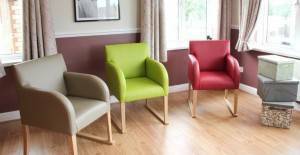 With our care home furniture, you can be assured of quality, stylish furniture that people will fall in love with. Hill and Hill have a huge range furniture for care homes to choose from in all manner of styles and designs all at fantastic value with great packages available. Interior design is now a key part of attracting new residents as well as making your existing ones as comfortable as possible. As well as looking great, our care home furniture is designed to be as safe as possible which is why all fabrics are fire retardant and waterproof. We also have a range of dementia furniture specifically designed to promote independence and stimulate memory amongst sufferers. We stock everything from sofas and chairs to beds and wardrobes to have your care home looking at its very best. In addition, we have soft furnishings plus loads of pictures and accessories to really make your home stand out from the crowd. We offer fantastic discounts with our full suites and packages so you could transform your entire care home today. Our care and nursing home furniture has completely transformed the fortunes of places across the UK and we have a brilliant track record in the healthcare market as you can see from our past projects. No job is too big or small for us and we will always strive to give you the best possible deal. If there is anything else you would like to know, please don't hesitate to get in touch with our care home furniture team today.